For the past decade, surveys have consistently showed that Canadians, and British Columbians, support legalizing marijuana. Centre-left minded voters were more likely to say they have enjoyed cannabis recreationally in the past, and some centre-right minded voters saw an opportunity to tax a sought-after resource. In spite of this high level of support, the road to legalization has been complex. In specific cities, bylaws related to cannabis commercialization have not been enforced. Just three years ago, more than 100 so-called dispensaries were selling marijuana and marijuana-related products in the city of Vancouver alone. The dispensaries were able to acquire a business licence from the city, even though selling non-medicinal marijuana was illegal. Now, as legalization nears, existing dispensaries need to apply to the provincial government for a business licence. The process is long. On the day legalization is enacted, there will be only one BC Cannabis Store operating. It is located in Kamloops. The current state of affairs calls for a detailed look at the way British Columbians would react to the location of pot shops. A provincewide survey conducted this month by Research Co.shows some staggering differences. Across the province, seven in 10 British Columbians (70%) say they approve of establishing marijuana stores in their municipality. The level of support drops to 56% when residents are asked about a pot shop that will be doing business in their neighbourhood. When asked whether they approve or disapprove of a marijuana store located a block away from their home, the numbers tighten dramatically. Across the province, 50% of residents say they approve of a pot shop located that close to their dwelling, but 48% disapprove. There is a gender divide: a majority of men (54%) see no problem with a marijuana store near their home; a majority of women (51%) eschew the idea. Age also plays a role, with British Columbians aged 18 to 34 voicing the highest level of support for a pot shop near their home (60%). Their older counterparts are not convinced, with approval dropping to 48% among residents aged 35 to 54, and to 44% among those over the age of 55. In Metro Vancouver, where many stores located in specific cities were able to offer marijuana under the guise of medicinal treatments, there is a complete split: 48% of residents approve of a pot shop near their home and 48% disapprove of it. On Vancouver Island, disapproval reaches 52%. Political allegiance also plays a role in shaping views on the future location of pot shops. A sizable majority of British Columbians who voted for theBC New Democratic Partyin the last provincial election (60%) have no qualms about a marijuana store being located a block from their home. 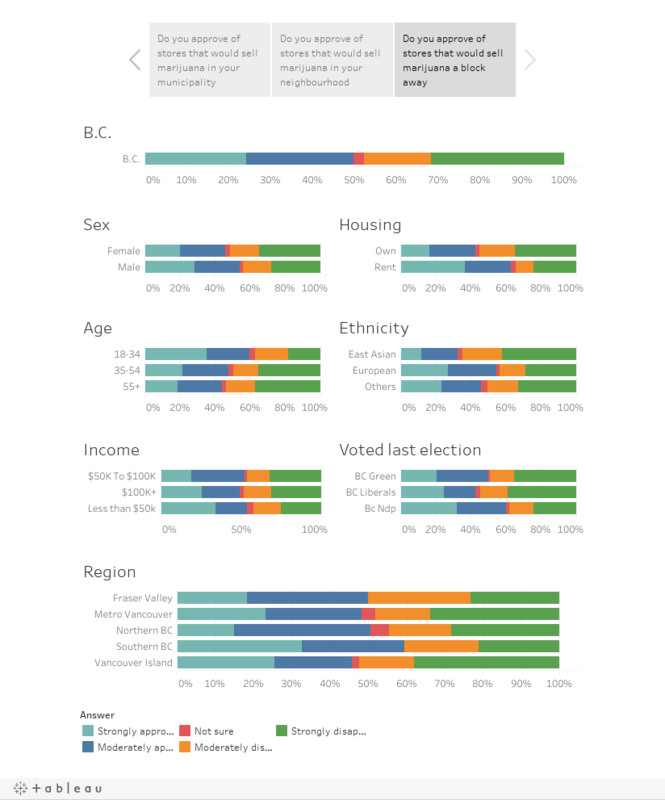 BC Green Partyvoters are staunchly divided (50% approve, 49% disapprove) and BC Liberalvoters are more likely to object (55%). The last layer of analysis is ethnicity. While 54% of British Columbians of European descent approve of having a pot shop nearby, the proportion drops dramatically to 33% among those of East Asian descent. East Asian British Columbians have consistently voiced displeasure about marijuana and its impending legalization, so this finding is not a surprise. It is evident that the legalization of cannabis will not go as smoothly as originally envisioned. The process of granting permits and business licences needs to be clear, and communities must be allowed to have their say about where marijuana will be sold.